Lizness Casual (Liz Baranowicz), right with aqua helmet, works with a team member to prevent the jammer, the skater with the orange star on her helmet, from the Jacksonville J-Villains from breaking though the pack during one of the jams at the March 17 bout at the Ellenton Ice and Sport Complex. When hearing the term “roller derby” many people of a certain age recall those rough and tumble roller skating events where two teams would push and shove to pass each other to score points as they whirled around a banked oval track. As exciting as those clashes between skaters in the 1950s and 1960s were, some in the audience had suspicions that the matches were choreographed, and the winners were picked ahead of time. Today the sport has become more professional, although the rough and tumble action has been preserved. 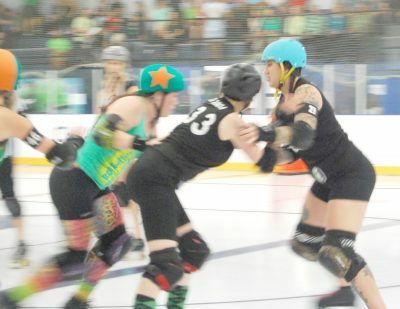 A local team of women roller derby skaters, the Bradentucky Bombers, held their first bout of the season March 17 at a new venue, Ellenton Ice and Sports Complex, 5309 29th St. E., in Ellenton. “We like it there,” said Andrea Cannistra, who handles publicity and promotions for the team. “They have a lot of other competitive sports, and this puts us up with them. One difference from the early days of roller derby is the games are now played on a flat oval track. And there are no railings to shove an opponent into, sometimes sending the skater head-over-heels into the audience. But there is still plenty of action, and audiences enjoy the competitiveness of the skaters in this hyper-contact sport. For Gigi Ramoan, who helped organize the Bradentucky Bombers in 2006 and still skates competitively, the move to the Ellenton facility is a new chapter for the league. “This is turning out to be our most exciting year yet,” Ramoan said. “We are now an apprentice league in WFTDA, our international Roller Derby governing body, and we moved to an amazing sports-centered venue. Souvenirs are sold at the Bradentucky Bombers flat track roller derby bouts to help support the league. The first game of the season March 17 against the Jacksonville J-Villains was held at the Ellenton Ice and Sports Complex, the new home court for the local team. The WFTDA, or Women’s Flat Track Derby Association, is the international governing organization for the sport. There are more than 400 members of the association. “The WFTDA sets standards for rules, seasons, and safety, and determines guidelines for the national and international athletic competitions of member leagues,” according to the organization’s website. “The team is going through big growth,” said Cannistra, who joined the Bombers in January 2015. “When the team first started it was more for fun, now we’re more professional and competitive. There are 40 members in the Bradentucky Bombers league. The league consists of an A Team and B Team, with 30 skaters and the other members as behind the scene support staff. The A Team, called the Bomb Squad, are all veteran skaters, and the B Team, Nuclear Bomb Shells, are just learning how to compete. “Plus there is a group of new young women coming in to help,” Cannistra said. The 35-year-old Sarasota resident joined the Bombers when a friend, Sarah Bikos, who is the head trainer for the team and has been with them for 10 years, asked Cannistra to check out roller derby. “I knew about roller derby, but wasn’t sure if it was for me,” she said. After going to a bout she decided to try it out. “I was looking for something with female camaraderie, and I found the team,” Cannistra said. The camaraderie also was one of the reasons Liz Baranowicz joined the Bombers. “When I was a kid, roller derby seemed so cool and tough,” Baranowicz said. “It’s still cool and tough, but the sense of being on a team and the camaraderie is also important. “It’s really a wonderful group and what drew me to it only got stronger,” said the 32-year-old Sarasota resident. All of the skaters have found a sport where they can be strong and aggressive while competing in one of the few action-packed contact sports for women. Lizness Casual (Liz Baranowicz}, center with aqua helmet, forms a tri-pod blocking cluster with her teammates to prevent the jammer, the skater with the orange star on her helmet, from the Jacksonville J-Villains from breaking though the pack during one of the jams at the March 17 bout at the Ellenton Ice and Sport Complex. “I always wanted to skate in roller derby since I was a teenager, but never lived where there was a team when I had the time, or if I lived in a town where there was a team, I didn’t have the time,” said Baranowicz, who has been with the league for more than a year. Being part of a team working together to win was a big draw for Cannistra also. Some of the excitement of the sport is because of the pace of the action. A bout consists of two 30-minute periods with a 15-minute break in between. 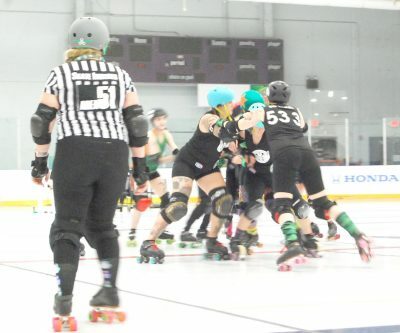 Two teams of five skaters each are on the track during a jam, where a wall of four blockers attempts to prevent the jammer of the opposite team from racing around the track where she can begin to accumulate points by passing the other skaters. One point is scored for each skater passed, and all this has to happen in two minutes or less. Even though the women take the sport of roller derby seriously, they still like to have fun. That is why all the women have skater names and alter-egos when they compete. Cannistra’s is Zombelina and Baranowicz goes by Liz Casual. Some of the other skater names team members use are Dita Von Cheats, Flirtin W Disaster and Sookie Smackmouth. 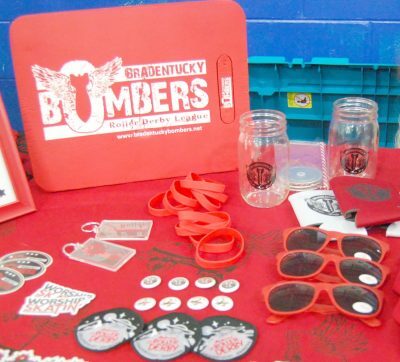 Although the Bradentucky Bombers are not your typical women’s club, they still are community oriented. Last Saturday’s raffle proceeds went to the ALS Association of Florida. This was important for Cannistra because her mother passed away from ALS. The next match is at 5 p.m. April 14 against the Dub City Militia at the Ellenton Ice and Sports Complex. For more information about the Bradentucky Bombers visit their website at bradentuckybombers.com, or their Facebook page.